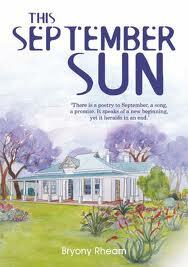 Book Review: Bryony Rheam's "This September Sun"
... and so my love for Zimbabwean literature just keeps on growing. I absolutely enjoyed reading Bryony Rheam's debut novel This September Sun, and would like to say a big thank you to Jane Morris from 'amaBooks for sending me a copy of this book to read. Set mainly in Bulawayo, Zimbabwe,This September Sun tells the story of two women - Ellie who is just trying to make sense of her life, and her grandmother, Evelyn, whom she had a really close relationship with. Growing up in post-Independent Zimbabwe, Ellie never quite fitted in and felt stifled in her hometown and just longed to escape. In the hope that she would finally find what she was looking for, she moved to the UK for her undergraduate degree, only to find out that something was still missing. While Ellie is trying to make sense of her life, we get flashbacks to her childhood in Bulawayo, the times she spent with her grandmother, as well as glimpses into what it was like being white in pre- and post-independent Zimbabwe. Ellie's life was also filled with secrets - well her family, and especially her grandmother's. It's not until Evelyn is brutally murdered and Ellie discovers her grandmother's diaries and letters that she is able to piece together Evelyn's life. It is only then Ellie is finally able to answer the many questions that were left unanswered, and in a way start making sense of her life. In This Septemebr Sun, Bryony Rheam goes back and forth in time (between 1940s and 2000s), to expertly weave two different women's accounts of their lives and paint possibly one of the most beautiful stories I have read in a while. Reading Evelyn's story and her life, I felt like I had found someone's diaries and letters. And I think I loved this book because it felt so real - the characters, the setting, their lives. At the end of the day we are all human beings with flaws. We laugh, we cry, we make mistakes, we do silly things, and we can all be annoying. Even more than that, I have never resonated more with a character than I did with Ellie- there were elements of her, which in a strange way mirrored me. And probably added to why the characters and the novel felt so real. This September Sun won the Best First Book Award at the 2010 Zimbabwe International Book Fair, and I can see why. Reading novels like this is what makes me love not just African literature, but really literature in general. I can only hope that more people get the chance to read this beautiful story.